On a sheet of paper draw an outline of a person's body. Cut out and use as a pattern. Cut two body pieces out of felt using the pattern. On one felt piece sew or add extra felt pieces or yarn for hair, sew eyes, nose, mouth, etc. Sew two body pieces together along all edges making sure the face is facing upwards. 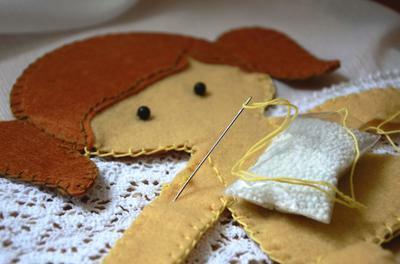 You can use a blanket stitch or a simple straight stitch. This is a fun project that kids can be creative and design themselves.